A range of 7 Vertical Borers are available from conventional 48 inch Webster and Bennets (with hydraulic pattern copying), up to 72 inch C.N.C. We have extensive experience machining a wide range of alloys for the aerospace, gas turbine, paper, petro-chemical and mining industries. The combination of our profiling, plasma cutting, drilling and vertical boring operations allows us to provide a very competitive service for large flanges in a variety of carbon steels including 43A (S275), 50D (S355), EN8 (08M40); Aluminium; Stainless Steels and Boiler Plate. 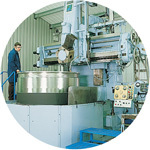 Casing for the aerospace industry. 700mm dia Flanges profiled, turned and drilled in-house. Large casing for the aerospace industry on a 72 Webster & Bennet.